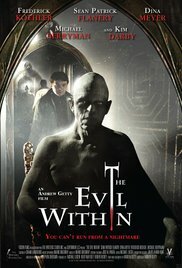 A horror thriller “The Evil Within” tells about a demonic entity from an old mirror that takes possession of a mentally unstable teenager. Closed mentally retarded boy Dennis Peterson experiences the death of his parents. Teenager is tormented by dreams – terrible visions, inspired by memories and long-standing fears. The only person close to him is his brother John, busy with work, solving problems and a beloved girl. Johnny can not sit by the side of a mentally ill brother, so Dennis is left to himself. The huge antique mirror, brought from the basement, beautiful, but frightening, draws the attention of the boy. To distract himself, Dennis starts to talk with a reflection, which eagerly listens to him. Soon it turns out that the mirror twin of the poor boy is a powerful demonic entity, rushing out.